Portugal, a stormy day in March: the hissing wind makes an unsuspecting driver stop by a rubbish dump where she finds a seemingly lifeless bundle of fur – an old dog, still breathing! At a nearby animal shelter, the dog – Lady May, as she is later named – is given emergency treatment, and Fate finally smiles on her. For the first time in her long life, she has a basket in a warm room, is given decent food and makes friends. Against all odds, there is even a family abroad that want to adopt her. But will she regain her health and her will to live? “The spirit of the book strikes a balance between happiness and sadness, kindness and cruelty, hope and despair,” says Zach-Miller. “It is a fantastical, magical, yet real story in which readers enter into a canine world to experience all the hardships and small joys that typify the life of a homeless dog.” The book evokes tears of pity and laughter, as Lady May and her eccentric new dog companions tell the vivid tales of their lives and encounter strange and wonderful adventures. Told in alternating voices of a narrator and Lady May, the book reveals the inner dialogue of the dog, sharing her heartbreaking and hopeful reactions to a world that had no place for her. Written to entertain and inspire an abiding sense of compassion for abused animals, the book is based on Zach-Miller’s own experiences as an animal advocate. Barbara Zach-Miller is a writer and professional translator. She enjoys 19th century literature, art and gardening, but her greatest passion is the protection of animals. She lives with her husband and their five dogs in a small village in the French-speaking part of Switzerland. This is her first book. Aanifeira recently launched their first book in December 2010 at a Porto restaurant attended by a group of around 130 people. 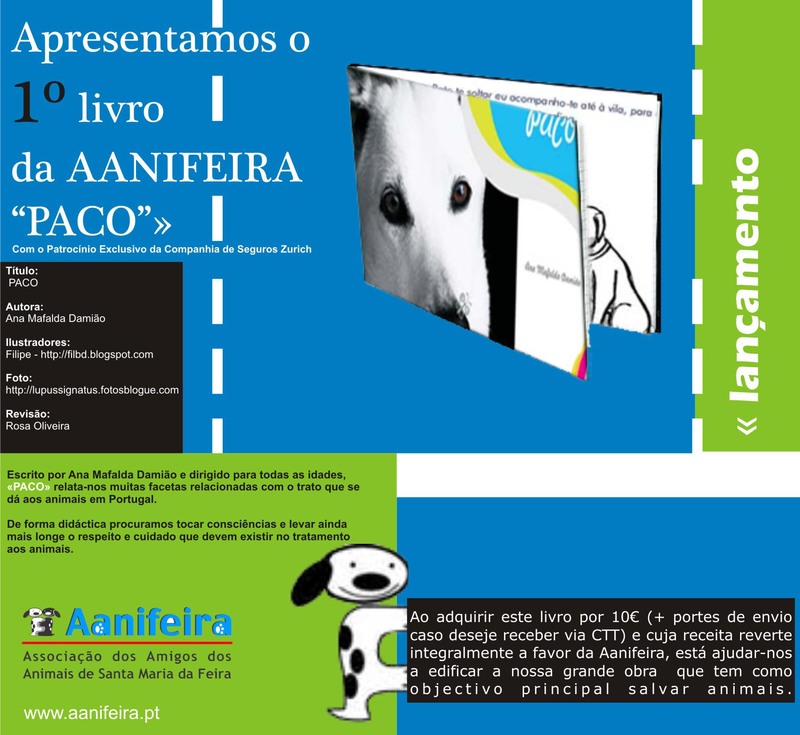 Written by Mafalda Damião and addressing all ages, “PACO” (in the Portuguese language) recounts the many aspects that concern the treatment of animals in Portugal. In an educational way, the book touches consciences and goes even further in making a point of the respect and care that should exist in the treatment of animals. All proceeds of the sales revert to providing care for the animals and improving conditions at the shelter.